This is yet another iftar special recipe from Amina Creations. Quick and easy, these chicken cutlets can be made a day ahead and fried just before iftar. They taste great with tomato ketchup. Take boiled potatoes in a large bowl and mash well. Add the cooked chicken pieces, chopped onions, ginger garlic paste, red chilli powder, salt, black pepper powder, coriander leaves and chaat masala and mix well. This would then look like a chapathi dough. Check for taste and add masalas as required. Add a few tbsp of bread crumb if it is sticky and not firm. Beat an egg in a bowl and keep a plate with breadcrumbs ready. Make cutlets with the chicken mix and keep ready. Dip each into the egg mix and coat well with the bread crumbs. In the same way make all the cutlets. Take an airtight container and arrange the chicken cutlets in it. You can refrigerate this and use when required. 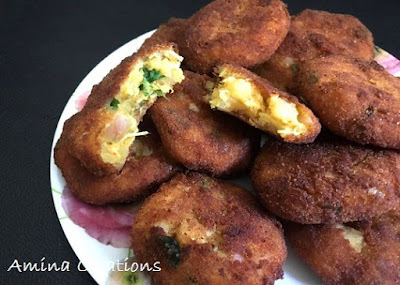 Just before iftar, take out the cutlets, heat oil in a pan and deep fry the cutlets till golden brown in colour.